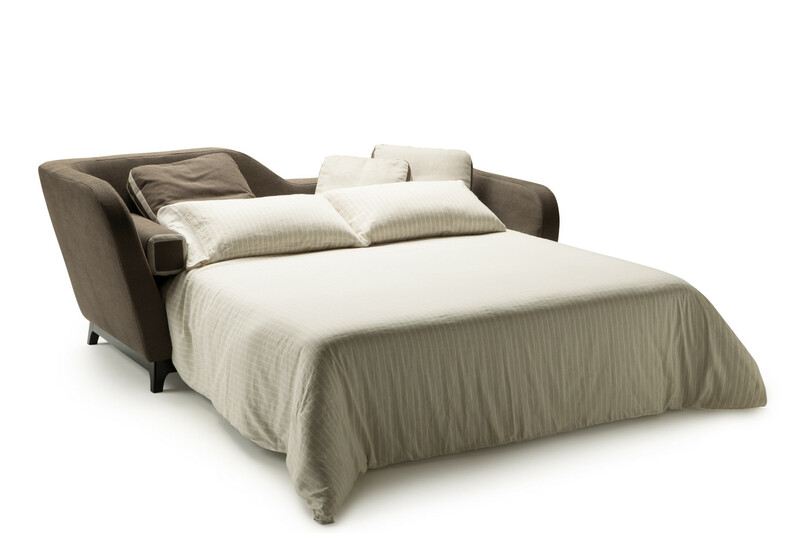 Jeremie by Milano Bedding is a dormeuse sofa bed, convertible into a standard double or French double bed. 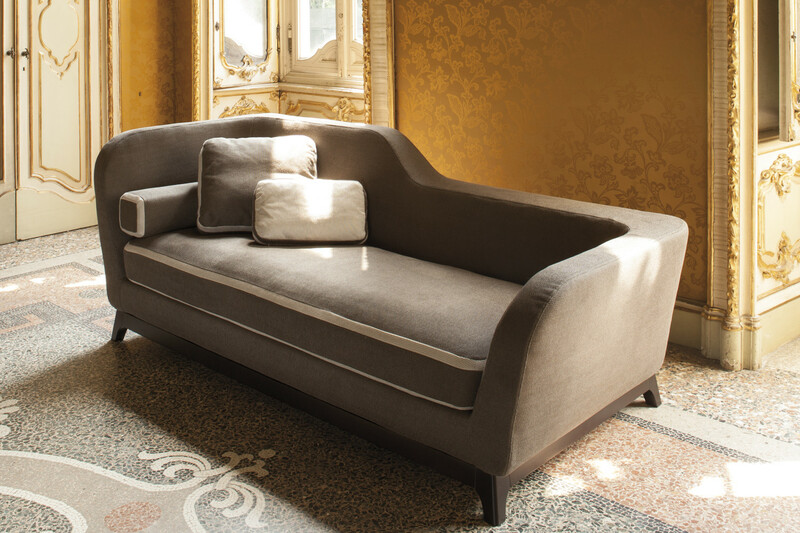 Characterised by a shaped backrest, this sleeper sofa reinterprets a classic art decò piece of furniture in a modern way, making it a design element where functionality and aesthetic look are enhanced at their best. 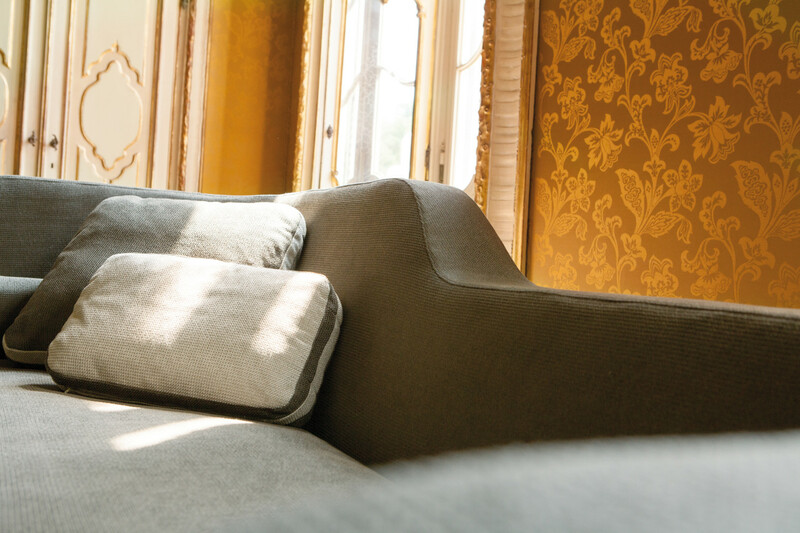 Thanks to its timeless design, Jeremie furnishes with style classic and modern environments: the wide range of covers available makes it possible to adapt the sofa style to specific tastes and needs. The same freedom of customisation also includes the solid wood base, that can also be lacquered in any RAL colour. 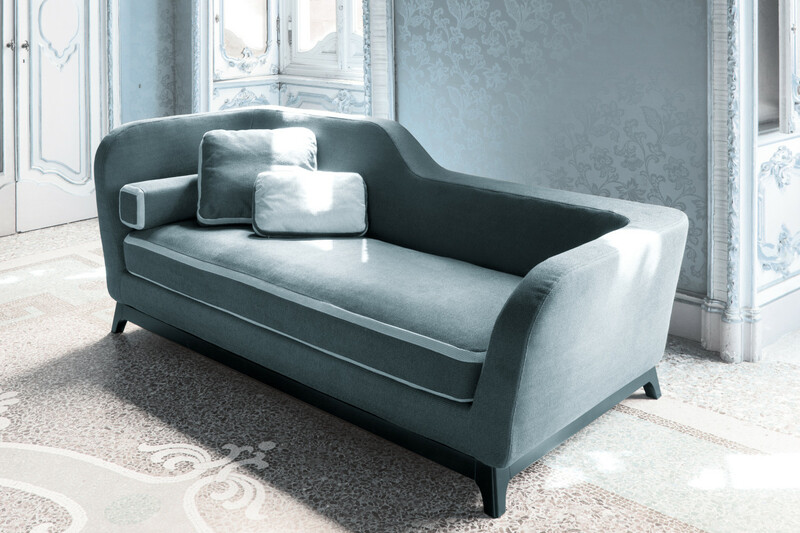 The quality of the materials used for the cover enhances the value of this one of a kind sofa bed even more: a solid wood base, fine fabrics and leathers, and special edition models created with covers by Designers Guild brand. All these characteristics also combine with the comfort provided by cushions padded with real feathers, supported by high resilience polyurethane inserts. The Lampolet mechanism guarantees high performances through time, other than being very easy to open and close. 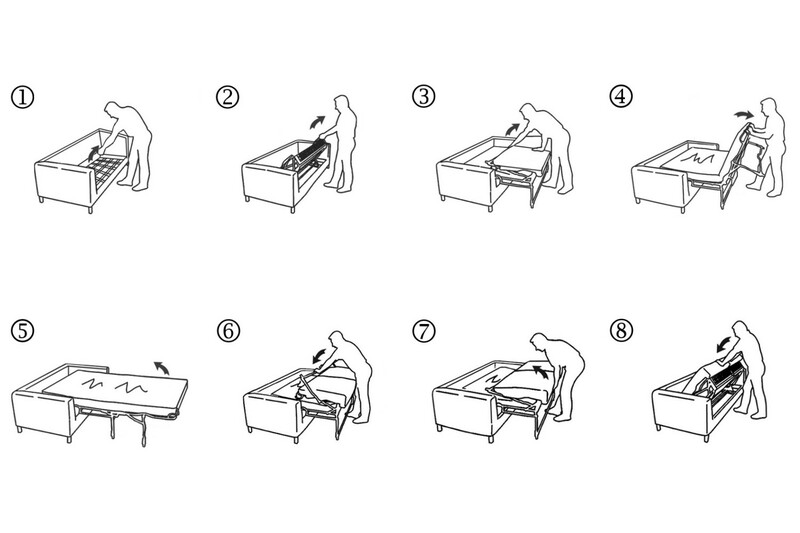 All models include a Standard h.12 mattress in resilient expanded polyurethane. As an alternative, several other mattresses with pocket springs, in polyurethane and latex are also available. The side is intended by looking at the sofa from the front. 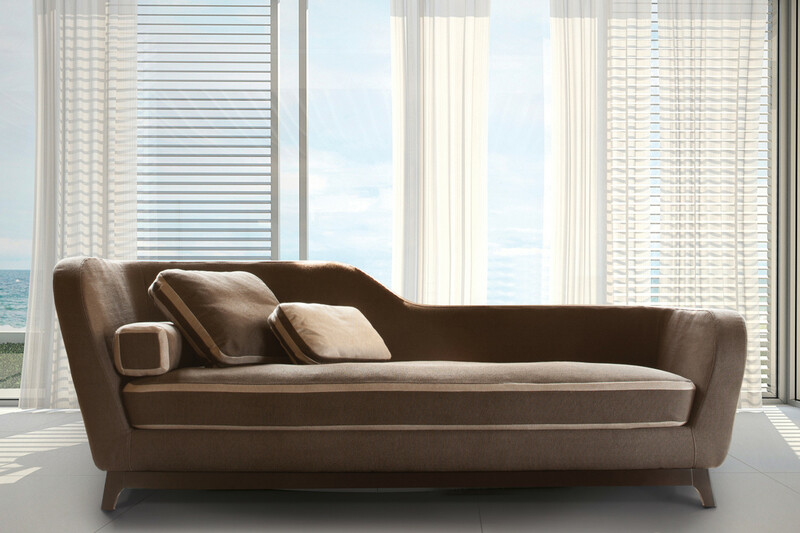 The sofa bed cover is available in fabric, leather and eco-leather in all the colours displayed in the samples page. It has a uniform surface, without stitching or seams. To obtain this effect, the materials are cut in an oblique way only. The seat cushion is available with contrasting edging. 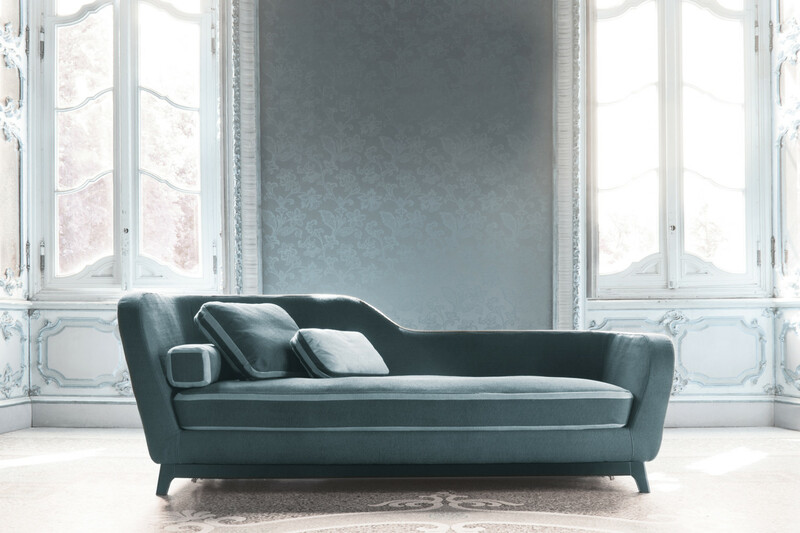 The colour can be chosen among the ones available for the same cover category chosen for the rest of the sofa. 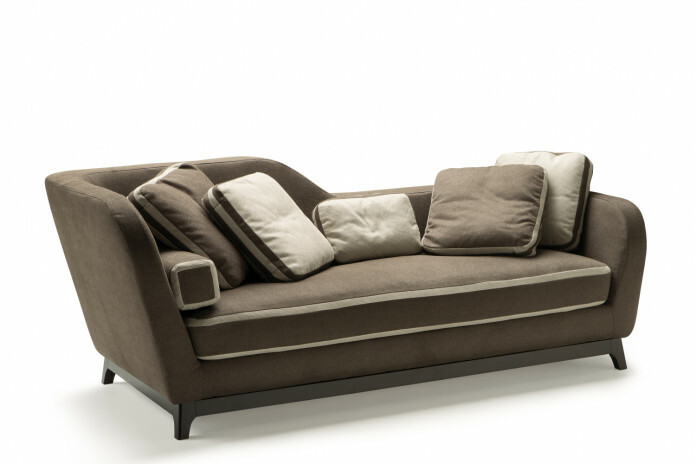 The sofa bed base is made up of natural or wengé painted solid beech wood. 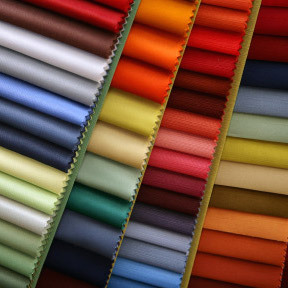 It is also possible to customise it by choosing one of the RAL chart colours. Mechanism or structure: high resistance furniture tube, oven coated with epoxy powders. Bed base made of plastic coated electrically welded steel mesh, fixed to the structure with springs (sofa bed only). Soft seat with elastic webbing. Mechanism opening and closing in two times. Standard Mattress: 35 kg/m³ expanded polyurethane covered with 100% cotton fabric, quilted on top and bottom with 400 g/m² 100% polyester wadding and nonwoven fabric. Base: natural or wengé painted solid beech wood. RAL colours on demand. Seat: white goose/duck down and polyester/cotton cloth, with a 35 Kg/m³ insert covered with 280 g/m² thermo-treated needled fibre and mm 2,5 quilted interliner. Structure: 40 Kg/m³ expanded polyurethane; 200 gr/m² resin fibre combined with interliner. Decorative Cushions (optional): white goose/duck down, polyester fibre and polyester/cotton cloth cover.